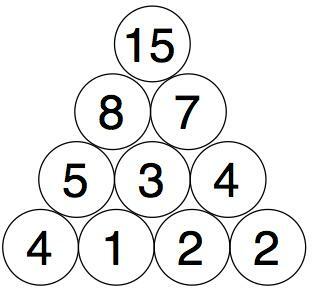 You need to find four starting numbers to place at the bottom so that when you get to the top it's 15 each time. 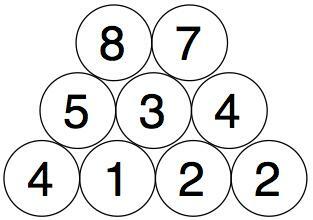 Try to find as many starting four numbers as you can. Think about good ways to do this. Maybe use a system! What little change can you make to the rules to explore again? What new ideas can you think of to make this different? Explore those! Here is a brand new variation that has lots and lots within it to explore No longer 4 numbers at the bottom, but 7 and they are 1, 2, 4, 8, 16, 32, 64 build it up in the same way as before and when you've reached the top EXPLORE and CREATE other versions. You may like to take a look at this follow-on activity: Build it up More. Practical Activity. Multiplication & division. Interactivities. Factors and multiples. Addition & subtraction. Visualising. Working systematically. Generalising. Combinations. Investigations.